"Oh say can you see" some star-spangled fun in your near future? Celebrating the 4th of July is hands-down one of the BEST things about summer! Can you remember the excitement of seeing fireworks as a child? Do you still feel that thrill today? I just love neighborhood parades, backyard grilling with friends and family, and wearing our red, white, and blue outfits to celebrate Independence Day. Of course, seeing fireworks is one of the July items on the Austin Summer Fun Checklist for Kids. Below, we've gathered listings of all the fireworks shows in the Austin area (note that some are happening before and after July 4th) so that you can plan ahead for your ultimate holiday celebration. Just be sure you remember to mark this one off your checklist and tag your July 4th Instagram photos with #AustinSummerFun for a chance to win extra prizes! Activities: Visitors can expect art vendors, Festival food and treats, several hill country fair type games will be available for adults and children to enjoy such as “ring the bottle” as well as water games like the “slip and slide” and “Screamin Demon”, and carnival rides such as the “Amazon Zipline” and “Bungee Trampoline”. Live music from Quiet Company, Dale Watson and his Lone Stars, Residual Kid, Lost and Nameless Orchestra, Mayeux and Broussard, and Minor Mishap Marching Band. Activities: A parade, a festival with live music (free admission), sports tournaments and a barrel race (admission is free for spectators). When: Thursday, June 26 - Sunday, June 29. Activities: Seed spitting contests, watermelon eating contests, live music and more! Cost: FREE admission on Saturday, June 28th from 11am - 5 pm. Admission is also FREE on Thursday, June 26 starting at 5pm and on Sunday, June 29th. Admission varies from $5 - $20 at other times. Activities: While Auditorium Shores is under construction, this show will move out to the Circuit of the Americas (COTA) this year. COTA will host a variety of fun, old-fashioned July 4th holiday activities, including interactive games and contests for the whole family. There are plenty of details regarding what is allowed to bring in and what is restricted. Cost: FREE admission, Free parking in Lot F, Up-close parking available on Lots H & A for $10. More Info: Click here for details regarding what is allowed in and what is restricted. Activities: Come celebrate and enjoy live music, bingo, a washer tournament, air castles, free watermelon and a fireworks display. Fees apply for food concessions, face painting, carnival games, hamster balls, super slide, quad jump, Races2u, spinner ride and rock wall. Milburn Pool will be open from 1-8pm with daily pool admission rates applying. More Info: Call the event hotline is 512-401-5888 for details. Activities: Visitors will find 60 arts and craft booths, 20 food vendor, kiddie rides, bounce houses and games, and a petting zoo. Musical entertainment will begin at the Gazebo at noon and will continue all day. A parade begins at 11:00 am at the low water crossing, ending at the Gazebo. More Info: Details available here. Activities: Hays CISD Performing Arts Center will entertain with music until the fireworks start. The free public program starts off with Kem Watts, a local singer and songwriter, performing from 7pm, followed by Starlight Symphony Orchestra at 8pm. OR there is a live music show at the PCGC Clubhouse from 6pm - 9pm that is free to the public (but parking is available by donation). More Info: Click to find info about parking and details about what is permitted. Where: There are 2 Entrances to the festival. Entrance A is located on US 183A South (between San Gabriel Parkway and Hero Way) and Entrance B is located on Hero Way (between Mel Mathis and US 183A). Activities: There will be live music, vendors, children's activities, and fireworks. More Info: Visit the Leander Parks & Rec webpage for more info. Activities: The evening kicks off at 6:30 p.m. with a free concert at the Landa Park Dance Slab. More Info: Visit the City of New Braunfels website. Activities: Watercraft rentals, music, kids' activities, food vendors, and more. More Info: Click for information about shuttle buses. Note that there is no on-site parking. Activities: Bring a picnic, a blanket or your lawn chair to Buda City Park and enjoy a children’s parade at 9 a.m., children’s activities and a magician from 9 - 11 a.m., and fireworks at 9:30 p.m.
More Info: Visit the Buda Chamber of Commerce website for more details. Activities: Round Rock Express vs. Nashville Sounds baseball game. Cost: Tickets from $7 and up. 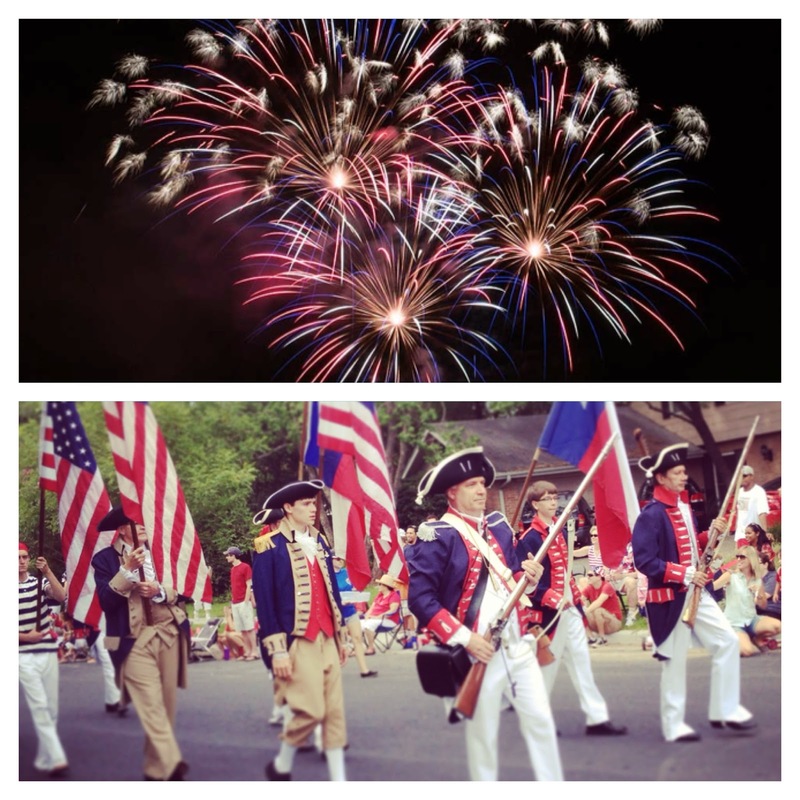 Activities: A parade, fireworks, carnival rides, jalapeno pepper eating contest, children’s games, Sam Bass Shootout, Movies in the Park and skydivers are all part of the City of Round Rock’s July 4th Frontier Days Celebration. More Info: View the full schedule and detailed event line-up. Activities: Join Hyde Park Baptist and the Quarries Church's Focus College Ministry at 7pm for Frisbee, kayaking, washers and a cookout! More Info: Visit the Bastrop Chamber of Commerce website for more info. Activities: We've Got Talent Contest, family fun games, tennis, Little Mr/Ms Lago Vista Contest, and the fireworks show at "dark 30" (roughly 9:30pm). More Info: Visit the special event website for details. Activities: They offer a fajita buffet and seating for the Fireworks show. Call 512-942-0367 for details. We know that if you have little ones, sometimes getting out at night for the big fireworks show is not always doable. No worries. 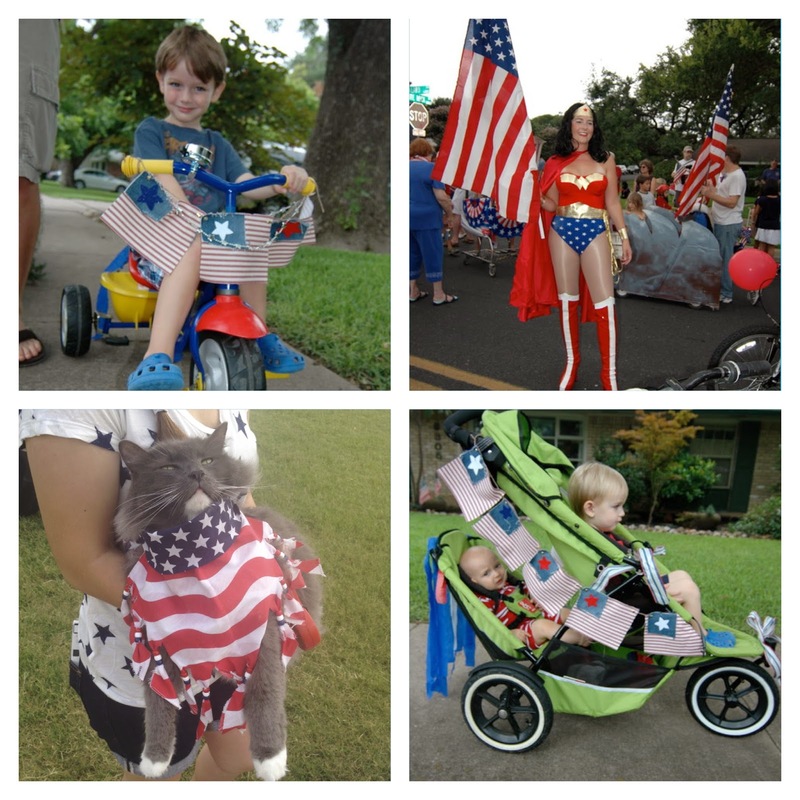 Here is a bonus roundup of local Austin parades where you can get out and soak up some patriotic style in the morning (before nap time). Allendale Neighborhood 4th of July Parade - July 4, 9 a.m. The Allandale Neighborhood Association will host their annual Fourth of July Parade, followed by patriotic festivities and awards for participants. To walk or ride in the parade, meet between 8:00 and 8:30 a.m. on Bullard, just south of White Rock, facing Gullett Elementary. The parade begins at 9 a.m. and will travel north along Bullard, ending at the Gullett Elementary sports fields. Mueller 4th of July Parade & Pool Party - July 4, 9:30am - noon. The parade lineup will be at Paggi Square starting at 9:30am. The parade will leave the Square promptly at 10:00am and head down Robert Browning then taking Mattie down to conclude at Ella Wooten Park. The MNA will provide refreshments at Ella Wooten where the Pie Contest will be judged at 11:00am and the pool party will be in progress! NWACA 4th of July Parade - July 4, 9 a.m. - 12 p.m. Parade starts at Waterline and Far West in Northwest Austin, then finishes with fun afterward at Doss Elementary. Steiner Ranch July 4th Parade: July 4, from 9am- 11am. The Steiner Ranch family parade will kick off at 9am at the Towne Square Community Center. Children are invited to bring their decorated bikes, wagons, scooters, and strollers to participate in the parade. Other activities will include games and activities, water slide and bounce house, kiddie splash area, chalk and bubbles, and local entertainment. Enjoy face painting, balloon twisting, a DJ, food, prizes and a visit from the Lake Travis Fire Department! Rosedale July 4th Parade - July 4, 9:30 a.m. Join your neighbors at Ramsey Park to celebrate the 4th of July! Gather at the bleachers in the park at 9:30 a.m. to decorate bikes, hats, strollers, etc. and then at 10:00 a.m., promenade around the park. Return to the bleachers for watermelon and a water balloon toss followed by carnival games and baked goods. Check back for more listings of neighborhood parades! Details from all areas were not yet available.